Last week was the ESRC’s annual festival of social science. This is the third year that SAGE has participated in a joint event with the British Academy, and forms part of our ongoing mission to champion the value and relevance of the social sciences. As Global Publishing Director Ziyad Marar remarked in his opening comments, social science gets used in policy making without the user even knowing where it came from. The goal of events such as this are to open up dialogue and channels of communication between the research and policy community. This year, we coordinated a debate on the role that social scientists play alongside the government in strengthening the public’s trust in scientific evidence. The debate around this topic stretches out to many different areas, such as whether social science research is considered by government departments in policy making; the role of interdisciplinary research in issues such as climate change and emergencies, and how social scientists can communicate effectively. We were delighted by the stellar panel who drove the debate forwards, dynamically chaired by BBC presenter Evan Davis. It was equally pleasing to have such a broad and passionate audience, including key figures from across the social science and policy sectors. There is a summary of the debate in a twitter stream here. Some of the most important points for me were around communication. Alice Bell in particular noted the need to work with the media (and wrote in more detail on this topic in the Times Higher Education prior to the event). Joint Head of Government Social Research, Jenny Dibden also commented that social scientists need to justify their research more than some other science disciplines, simply because the issues are more complex. This was as much an issue for her as a civil servant as for an academic researcher. Nearly all panellists stressed that the government want to hear the evidence, although they may not always agree with it. It was notable that Julian Huppert MP pointed to the polar opposite between researchers and policy makers in testing hypotheses. He was echoed by distinguished researcher Anthony Heath, who talked about how social scientists can help policy makers by showing what is working and what isn’t. The other key take-away for me was the repeated message from our 2010 event: that the big challenge is to get social science education established at an early stage. As has been the case with climate and environment initiatives, it should be a real target for social scientists to be educating children about what social science offers. You can read some other perspectives on the event here , here and here. 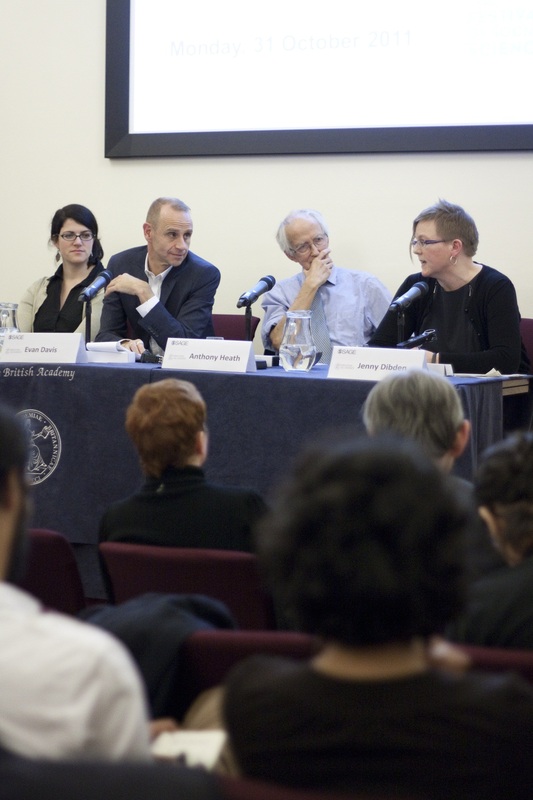 Thanks to our panellists: Alice Bell, Jenny Dibden, Anthony Heath, Julian Huppert, and our chair Evan Davis. Thank you also to our partner the British Academy, and our media partner Times Higher Education. You can watch the event in full below. Let us know your thoughts on this topic we’d like to see the debate continue. This entry was posted in SAGE Connection, SAGE news and tagged #esrcfestival 'BASAGE11, Alice Bell, Anthony Heath, British Academy, ESRC Festival, Evan Davis, Jenny Dibden, Julian Huppert, SAGE, social science. Bookmark the permalink.